Doll three by Jenny Stacy. Love the way she blends into my knitting! The first doll by Jenny Stacy. She's also pictured below but now she has a new bonnet. These are the first dolls I've made in quite a while. Earlier examples are pictured in the right hand side bar of this blog. It's given me such satisfaction to make these, mostly while in the shop between customers. They are just the right size to snuggle like a baby in the crook of your arm. While I was making them I was thinking about my mother and wishing I could give her one. I was also strongly reminded of my mother yesterday when I visited the Balenciaga exhibition at the Victoria and Albert museum. I took loads of photographs but I don't think I can publish them on social media... Anyway there were lots of examples of clothes made in the 50s and 60s similar to designs my mother wore. She was always very clothes conscious and as her mother was a tailoress, she could point out any style she particularly liked in Vogue magazine and my grandmother could make a pattern from the photograph and set to work. 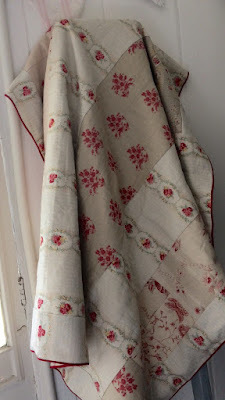 Reversible patchwork throw made by Niloo. Peonies are in full bloom in my garden right now. Love them. This week I am enjoying making dolls again. I have four on the table and the one pictured is the first to be finished. On Saturday Niloo bought in three new reversible throws she has made. They are all beautiful. The others are pale in colour so more difficult to photograph but I'll try today. Peonies are blooming in the garden! Studio Kimono's patchwork bags made from vintage kimonos. 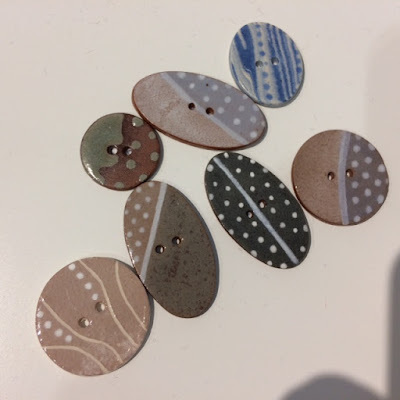 Handmade buttons by Stockwell Ceramics for sale in Handmade Happiness now. Globe Home gift wrap paper. Monday saw me at the Pulse trade fair at Kensington Olympia. So much to see, most of it off-limits for me. Handmade Happiness only stocks items made from scratch in the UK and most of its stock is made locally in and around Petersfield. 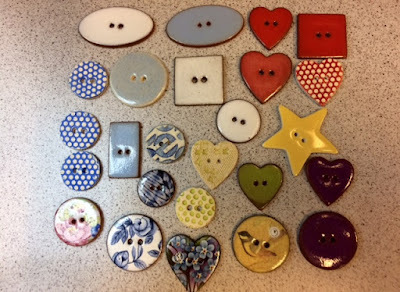 I am looking forward to stocking ceramic buttons like the ones pictured. I was tempted by the pretty hats handmade by Gil Fox and I'm also thinking about handmade dog collars and leads which I think would sell well locally. Some companies with large minimum orders and long waiting times, like the girls who told me there was a £400 minimum order and nothing would be released before October dampened initial interest but other companies were friendly and accomodating. I fell for some delicate lights like dandelions which I look forward to having in the shop in the run up to Christmas this year. In the window now. See details below. Close up of above shelves middle left. Dragonfly brooch made by Annie Sherburne and llittle bird brooch made by Carol Smith. Different things are displayed in the window every week. Right now in the top picture, left to right, is a ceramic pot by Niloo, a cashmere baby bonnet knitted by Patricia and a mug made by Justine Jenner. Next row: Sheila Barrow's small embroidery; Justine's tall mug with yellow inside and Elizabeth Eveleigh's birthday cake candle made of pure beeswax. Just below: Justine's sugar bowl; Brenda Tilbury's patchwork lavender pillow using vintage fabrics and Sue Inglis' sheep brooch. Bottom row: Two of Sue's knitted brooches, one of Justine's larger mugs with orange inside and a pair of Kate Box's wristwarmers. In the second box are two pretty flower mugs made by ceramicist Kate Hackett and a hand sewn bear by Lindsey Agostinelli. Next row: See larger picture plus two ceramic brooches made by Samantha Robertson and two gift boxes decorated by Sue Inglis. Samantha Robertson also made the little jug below and Sue Inglis made the popular cat keyrings. Brenda Tilbury made the Liberty fabric lavender bag. Yesterday Justine Jenner brought in more grey large size mugs. I started making notes about Christmas stock and new ideas for Christmas decorations. It may be May but I need to think ahead!! These beautiful, larger size bowls made by Justine Jenner were delivered yesterday. Love this fish cushion with velvet made by Tanya Williamson. New cushions made by Tanya Williamson in Handmade Happiness now. I feel so lucky and honored to sell such special, desirable things in Handmade Happiness. Tanya and Justine are two of the very talented makers stocked by the shop. Another is Kate Box who makes colourful, soft knitwear. We had a meeting yesterday for me to see the prototypes of new designs she has made. New colourways, new shapes but maintaining her excellent standard and I'm sure customers are going to love her new range. New! 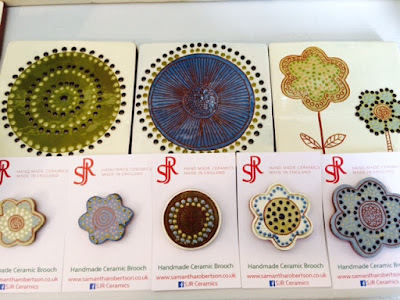 Knitted brooches by Sue Inglis. These cute, fun brooches by Sue Inglis are £7.50 each. Apologies for not having written lately. I'll try to do better this week. The truth is I've got a chest infection which is a nuisance as I don't feel I've achieved much lately. But with the help of antibiotics it's going. I've not had to take time off from the shop but probably I've been a bit lacklustre lately! Today I'm looking forward to seeing more cushions from the talented Tanya Williamson and I have just emailled Bee Mellor who has made some beautiful birds for the shop. The sun is shining and I have a feeling it's going to be a good day. Enjoy your day too!